Although modern conveniences slip into camp with gas stoves and espresso machines, within every person is an ancient connection with the campfire. Life without a microwave may strike some as primitive and that’s the point. Breakfast, lunch, dinner and desert, campfire cooking is simple and excellent food. Even cooking mishaps taste better within the framework of a long days outdoor activity! The simplest foods become great fun when cooked on a stick. Hot dogs and marshmallows come to mind first although more advanced foods are quite common and easy to prepare. Don’t overlook shish kabobs, load those sticks with vegetables, marinated meats and a couple of fruits for great cooking over a fire preferably on a grill. Steak or chicken often acts as the base for shish kabobs, tomatoes, onion, green peppers, pineapple and whatever strikes your fancy. Breakfast on a stick is good too. Simply mix up some Bisquick (premade batter mix) to a thick consistency and wrap a handful around the end of your cooking stick. Cook the biscuits until golden brown and serve with a little butter. Kids have a lot of fun with this one. Griddle cooking over the fire is similar to cooking at home. A cast iron griddle or frying pan is best. For back country hiking lighter cooking ware will do fine. If the fire pit doesn’t have a grill already, rocks or even firewood can be arranged to support the griddle over the coals. Hamburgers, pancakes and anything else you fry at home tastes best with a hint of wood smoke. Campfire coals have cooked untold meals over the millennia! Hobo Stew is prepared using a burger and vegetables double wrapped in tinfoil with a sprinkling of beef bouillon. Each person’s portion and package should be wrapped separately and set on the live coals in the fire and turned after about 10 minutes. Check a package to make sure it’s cooked through and serve in the tin foil. This cooking method is also great for potatoes, trout with butter, salt and pepper. 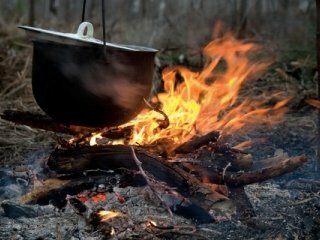 If you really love camping and cooking, learning to cook using a Dutch Oven. Dutch ovens are large cast iron pots with a heavy lid. Dutch oven cooks make stews, breads, cobblers and roasts using slightly specialized recipes. Simply put the recipe in the oven, set it on the coals and put coals on the lid as well. Time and heat does the rest.